Originally, we had other plans for dinner on our last night in Victoria. However, I was open to suggestions and that was certainly the case. 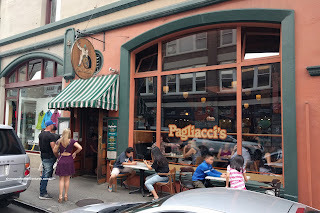 When we were in Nanaimo, our friend suggested we try out Pagliacci's. In fact, someone else gave the same recommendation via IG as well. 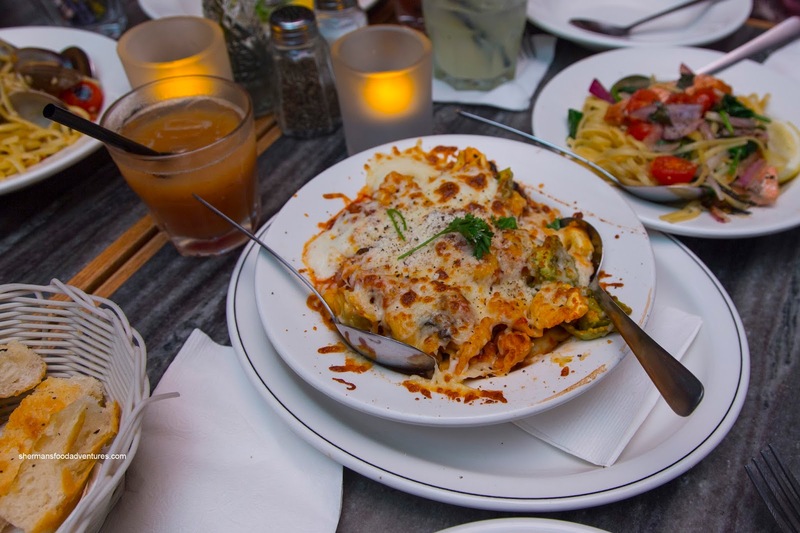 That sounded good since we love pasta and the place is kid-friendly. Furthermore, it was only a short 3 block walk from our hotel too. Now the place is generally busy, so we were prepared for a wait. I guess it was our lucky day as it was only 10 minutes. 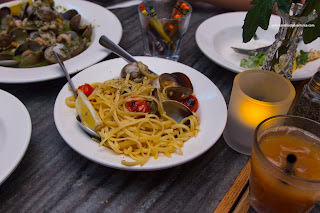 We decided to share some pastas including the Linguine Vongole that was prepared with fresh clams in the shell. This turned out to be quite light and mild-tasting. There definitely was minor hints of garlic, beurre blanc and herbs, but the dominant flavours were the clams and tart cherry tomatoes. With that in mind, if we got all of the ingredients in one bite, there was enough there for impact. 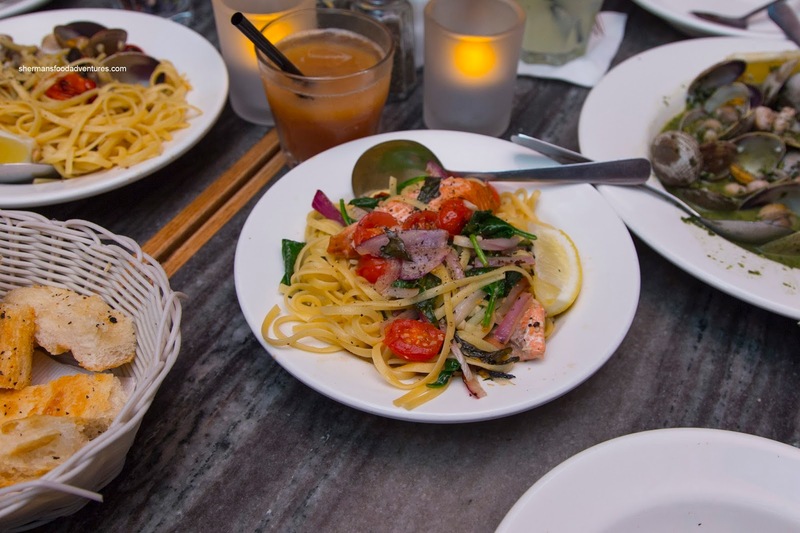 With a somewhat similar flavour profile, the Salmon Sing in the Street featured spinach, basil, wild Sockeye salmon, red onions, cherry tomatoes, lemon, white wine and olive oil. This one was more tart due to the lemon and sweeter because of the onions. It was also light-tasting except when eaten with the tart tomatoes and fairly moist salmon. In both cases, the pasta was fairly al dente, but not firm. My son decided to try the Cabinet of Dr. Cappelletti sporting tortellini stuffed with beef, ricotta and Romano & Parmesan cheeses in a marinara sauce with mushrooms, onions, red wine and topped with baked mozzarella and Parmesan. We found this to be quite tart with the Earthiness of mushrooms and sharpness of the fairly raw onions. The tortellini was al dente with a fairly flavourful filling. There was no shortage of baked cheese on top, but we felt this was our least favourite pasta. Our last dish was the Old Man & the Sea 1lb. of Vancouver Island Clams. The sauce consisted of pesto & shrimp beurre blanc which was sweet and shrimpy, but totally too salty. So much so, the herbs were a bit obscured. 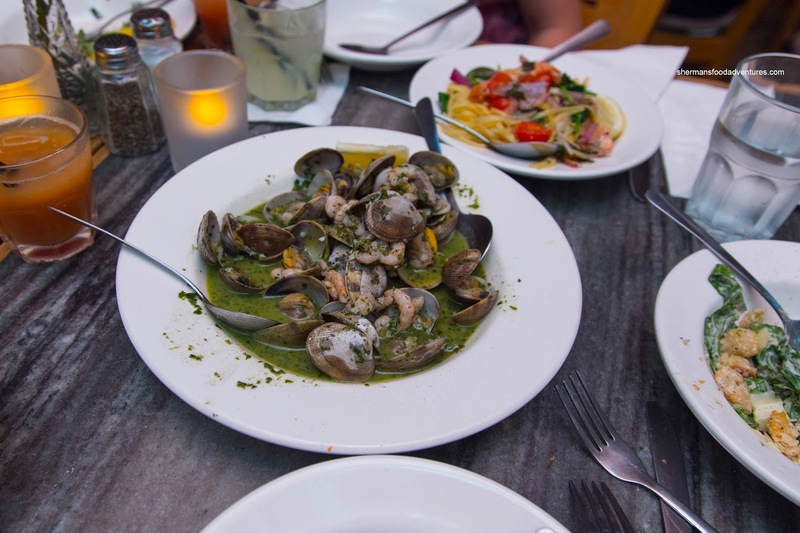 Despite that, the clams were plump and perfectly prepared. Overall, we were indifferent with the food at Pagliacci's. It did the job, but was hardly memorable either.